With the growth in our reliance on information systems and computer science information modeling and knowledge bases have become a focus for academic attention and research. The amount and complexity of information, the number of levels of abstraction and the size of databases and knowledge bases all continue to increase, and new challenges and problems arise every day. 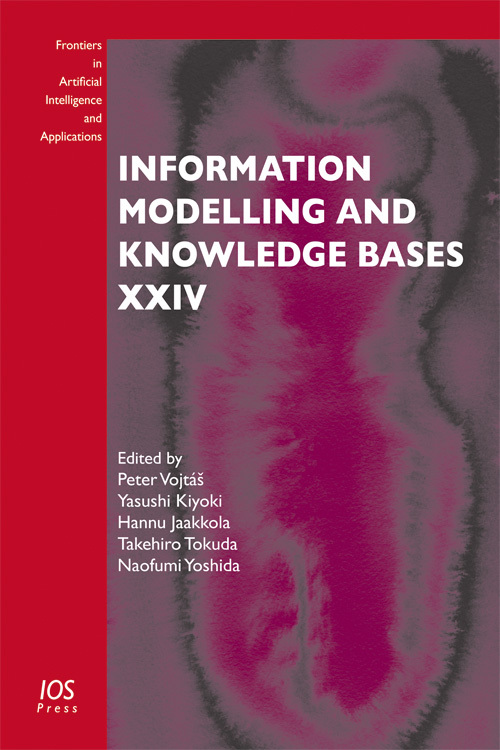 This book is part of the series Information Modelling and Knowledge Bases, which concentrates on a variety of themes such as the design and specification of information systems, software engineering and knowledge and process management. Attention is also paid to theoretical disciplines including cognitive science, artificial intelligence, logic, linguistics and analytical philosophy. Selected papers cover many areas of information modeling and knowledge bases, namely theory of concepts, database semantics, knowledge representation, software engineering, WWW information management, context-based information retrieval, ontological technology, image databases, temporal and spatial databases, document data management, process management, cultural modeling, social networks, personalization, interfaces, data mining and many others. The book will be of interest to all those involved in research and application in these academic areas. Edited by: Vojtáš, P., Kiyoki, Y., Jaakkola, H., Tokuda, T., Yoshida, N.